You’re probably all familiar with the inverse law of fantasy armour for women: the less the armour covers, the more it somehow miraculously protects. 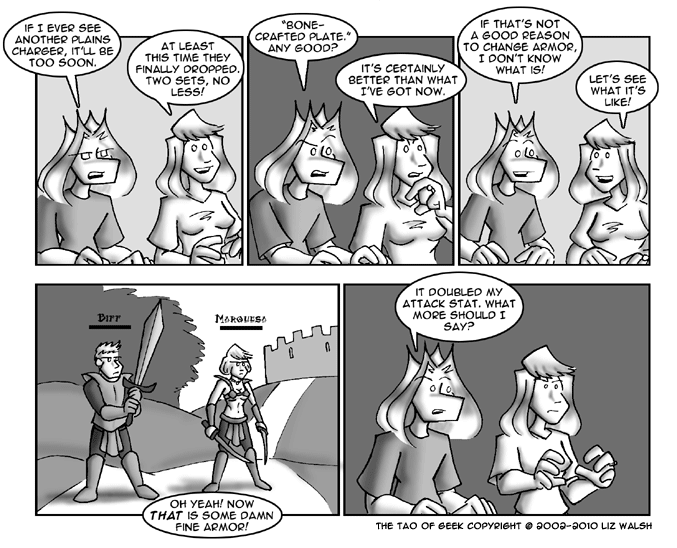 Liz Walsh writes and draws the entertaining web comic Tao of Geek and I quite enjoyed her story about Naomi campaigning not for sensible armour for women, but in equal cheesecake for her male barbarian character. The story starts here and if you don’t have a whole lot of time, you should at least check out the final punchline here. I laughed myself silly… and I admit I might have done something similar in games where the early armour, especially for spellcasters, provides no benefit whatsoever. (Let me tell you, it made the early cut scenes in Dragon Age really hilarious…) Anyone else want to fess up to silly fun with the game rules? This entry was posted in Uncategorized and tagged fantasy, Gaming on 2010/03/16 by terriko. Just last night my husband was showing me some skimpy armor that he got for a female WoW character, and mentioning that it looked totally different on the male characters. Why can’t we have some hunky eye-candy too? Best line was “the dev team didn’t think of everything. Nethack reference FTW.